The event will be held September 10 – 14, 2018 at multiple locations in Oak Ridge and Knoxville, TN. It is the combined efforts small and large businesses; local, state, and federal agencies; colleges and universities; and non-profit organizations. 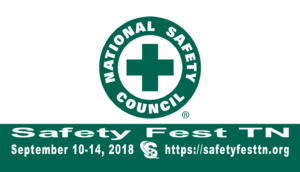 Last year’s event included 103 free safety classes, sessions, and demonstrations. The 77 instructors and presenters were graciously provided by organizations, just like yours, giving back to the community. Your organization can partner, sponsor or provide resources too!